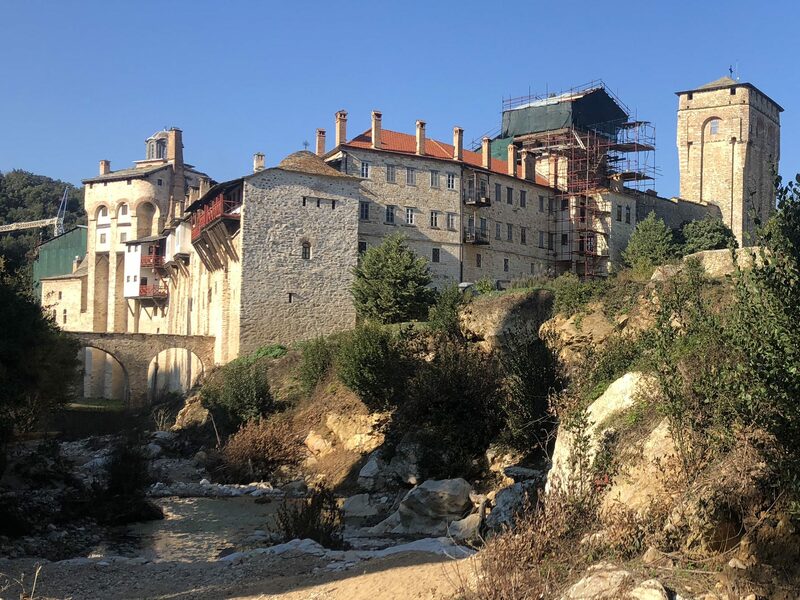 The Hilandar monastery on Mt Athos is home to invaluable medieval Serbian art and historical objects, and offers a spiritual experience visitors will never forget. For anyone who has had any kind of brush with the Serbian education system or the Serbian Orthodox Church, Hilandar is etched in the memory as the place where the glory of medieval Serbia survived almost intact for more than eight centuries. Hilandar was founded in 1198 by Stefan Nemanja, the first ruler of the Serbian medieval Nemanjic dynasty, and his son, Archbishop Sava, who secured the autonomy of the Serbian church and is one of the most revered saints in Serbia. It is part of a unique community of 20 monasteries and several hermitages that are huddled on the verdant slopes of the Mount Athos peninsula in Greece. The Holy Mountain, as the community is known, was founded on the mountainous peninsula that is considered to belong to the Virgin Mary, as she, according to legend, once took refuge there on her travels. The monasteries, the oldest of which is the Great Lavra that was founded in 960 during the Byzantine era, still form the Monastic State of the Holy Mountain, which is legally separate from the Greek state. The community observes a number of its own regulations, the most famous of which is ‘avaton’, the ban on women setting foot on the peninsula so as to ensure celibacy and preserve the focus of the monks and pilgrims on celebrating the Virgin Mary. Hilandar comes fourth in the hierarchy of the Athonite monasteries and is one of the richest in terms of lands and endowment, thanks to the donations from Serbian and other Orthodox nobles. During the early 14th Century, Hilandar and the entire Athonite community were heavily supported by Emperor Dusan of Serbia, who came to the monastery to escape the plague with his wife Helena of Bulgaria, who was carried around so as not to touch the holy ground and break ‘avaton’. Later the monastery enjoyed protection and donations from Vlad Tepes Dracula (better known as Vlad the Impaler and popularised by Bram Stoker), as well as Gjon Kastrioti, the father of Gjergj Kastrioti Skanderbeg, an Albania national hero who fought the Ottomans in the 15th Century, who joined the monastery’s brotherhood and after whom one of the towers on Hilandar’s vast estate is named the Albanian tower (‘arbanaski pirg’). After a 265 issue run, Belgrade Insight, BIRN’s bi-weekly Belgrade-focused English-language newspaper, printed its last paper edition on Friday 21 December, 2018. In its decade-long life since 2008, Belgrade Insight sought to bring quality journalism to its readers and subscribers. Belgrade Insight covered political and economic developments in Serbia, but also told stories about people, businesses and events which shaped a unique and multi-faceted city like Belgrade. In addition to detailed analysis and coverage of political, economic and business affairs, Belgrade Insight provided its readers with everything that expatriates, short-term visitors and local residents need to know in order to enjoy this great city. It the past decade, it saw many changes in Serbia’s political and cultural climate: from the deep recession of early 2010s to Serbia’s candidate status in the EU, through Belgrade’s first Eurovision song contest and re-opening of city’s museums. Although Belgrade Insight will no longer be printed, BIRN journalists and associates will continue their coverage of Belgrade and Serbia through the Balkan Insight website.